Superflow...Thailand’s first City Beach Club Soft Opening Party! Superflow City Beach Club. A classy, unique concept whose time has come and a fresh new face for one of the most frequented roads in Bangkok. Superflow combines the best elements of a stylized, funky, and fashionable day and night club, lounge/bar, the famous Tom Yum Kung Restaurant… and fuses it seamlessly with what Thailand is so famous for: the open air beach club. Top notch entertainment will be provided for our soft opening party with the world famous and Ibiza legend DJ JONATHAN ULYSSES, the longest running resident (18 years) DJ of WORLD’S BEST CLUB SPACE IN IBIZA, manning the decks and bringing a magical 3h exclusive house set to Bangkok. Expect a day and night with amazing music, beach club vibes, lots of eye candy and delicious food and drinks. 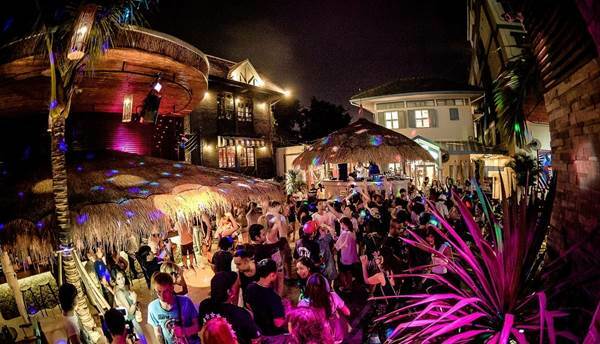 Superflow is set to be the one and only City Beach Club venue in Bangkok, and in fact, Thailand. It is a name equal to not just the hot new destination, but the only destination for daily day and nighttime parties…with constantly changing themes and music by today’s hottest international and local musicians and artists, as well as exclusive partnerships with leading party brands on the global club circuit. Like any true beach club, the entertainment starts by late afternoon and goes well into the late night…with different themes, special events, live acts and visual elements…all in place to capture both the day and night vibes of a real beach club. Superflow City Beach Club is a one-of-a-kind concept perfectly suited to international travelers with a flair for the Bangkok party scene, urban professionals, local trendsetters and movers and shakers alike.